Unless someone bakes extensively, one would typically have no need for molasses. I don't bake, so I never experienced using this product at all. Growing up, I've heard molasses as some kind of a food supplement for humans and a staple for horses. But I learned much later that there are so many uses for this honey-like substance that is a by product for processing sugar. Molasses is also used for some brands of tobacco used for smoking. It's added to dark brewed beverages such as stout and very heavy dark ales. It is used as an additive in livestock feeds and in fishing groundbait. On the horticultural scene, molasses can be added to the soil of almost any plant to promote microbial activity. In my search for organic fertlizers, molasses came up often. In fact, in my research for my vermicomposting project, molasses was mentioned as a component for making "worm tea" fertilizer. Apparently, it is molasses that feeds the microbes that will be beneficial to the soil - and more. Liquid molasses, dry molasses powder, brown sugar, corn syrup - source of fast consuming sugars for feeding and breeding the aerobic bacteria in compost teas. Most microherd populations love the high carbon content in sugar products. Sugars are best dissolved and broken down by microbes in compost tea that has brewed at least 1-3 days, before applying to the soil. If too much sugar is added on soil straight as a topdressing, it may cause a temporary nitrogen deficiency in the soil as the microherd populations grow too fast. Molasses also contains sulfur which acts as a mild natural fungicide also. 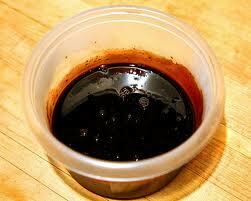 Molasses is also a great natural deodorizer for fishy teas. The last sentence in the above quote mentions molasses as a deodorizer. In my homemade fish emulsion DIY project, molasses is a saving grace that masks the strong and offensive rotting fish smell. It doesn't remove the bad smell, it simply masks it. But as mentioned in the above quote, it also helps in feeding the microbes in the fish emulsion mix which eventually become responsible for benefiting the soil. 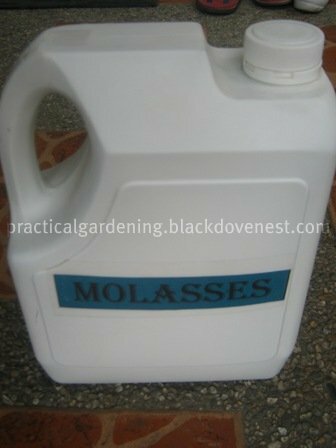 Recognizing the value of molasses as a component for making homemade organic fertilizers, I searched around for information. Molasses is the black syrup remaining after the sugar syrup has been boiled and passed through the centrifugal for the last time in the mill or refinery. If you have access to a sugar mill (which I don't), then you might get it at a cheaper price. Sources of bakery supplies would have molasses. Big supermarkets might have it in their "baking needs" section, but I've not had any luck in my search. I found that there is also a food-grade type of molasses that can be bought in health food and food supplement stores. One health food store that carries molasses is Healthy Options. They have bottled molasses that cost Php 299 for a 16 oz. bottle (16 oz. = 1 lb.) and Php 459 for a 38 oz. bottle. Realize that these are food-grade products and tagged at mall (read: expensive) prices. These are definitely expensive for something you'll dispense as fertilizers. Other places that you can get molasses more cheaply will be where there are horses. There are horse stables near horse race tracks so definitely there will be supply stores that will cater to horses. If there are horse drawn carriages (calesas or caritelas) near your place (Binondo, Pampanga and other provinces), then there will definitely be horse supply stores that cater to the business. Asking the cochero (horse drawn carriage driver) will be your best bet. Will this type of molasses be good enough? Well, if its good enough for the horses, then yes, it's good enough for the soil microbes. We were able to get our molasses from a supply store near the race track at the San Lazaro Leisure Park in Carmona, Cavite. Here are the map and directions going to the San Lazaro Leisure Park. We were at the horse race track to haul aged horse manure as a source of organic fertilizer for our garden. The supply store's name is ACGS and sells supplies like horse shoes, horse feeds, horse shampoo, horse grooming supplies and more. The gallon of molasses bought at ACGS is shown below and costs Php 200 (price as of 2012). Pricewise, this is so much cheaper. Molasses has an average density of 11.9 lbs. per gallon. So the Php 200 per gallon cost translates to only Php 16.8 per lb. This is so economical because a gallon goes a long way towards making your homemade organic fertlizers. Do you have a telephone number to call them pls. Thanks. It's probably in the receipts, but I normally don't keep them. So, sorry, I don't have the number.